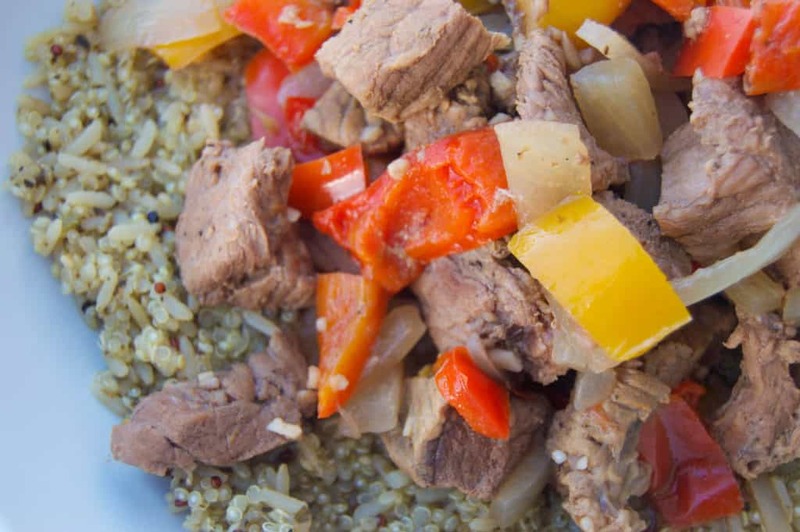 This Slow Cooker Steak and Bell Peppers is so easy to make and a must try that you are going to love! A favorite slow cooker recipe of mine and a big winner with the hubby. I’m a red meat lover, and while I try not to eat it as often as I would like I love it when I do and can’t get enough. This meal was a big winner with the hubby, and you are going to LOVE what I did with the leftovers. The best part though, I’ll be honest, is the fact that it was made in the slow cooker! I made a brown rice and quinoa mix to pair it with, but you can eat it so many different ways. 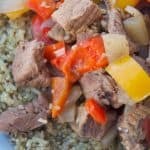 If you love the slow cooker as much as I do make sure to check out some more of my favorite slow cooker recipes like this Slow Cooker Beef Stew and Slow Cooker Chicken Fajitas. Since I love steak so much I grabbed some sirloins, and cut it into cubes/bite size pieces. You can use any beef or steak that you like, and cut it into bite sized pieces. You also have options with serving, on pasta, rice, or even a salad. I think my favorite way of serving was the next day in my eggs! I tossed some leftovers in a skillet with my scrabbled eggs! Ya’ll it was SO good! Now it’s time to get cooking! All you need to do is toss it in the slow cooker, and then decide what you will be serving with it? I can’t wait to hear all your ideas. If you LOVE this recipe make sure to check out even more Family Friendly Recipes (with printable shopping list) before you go! 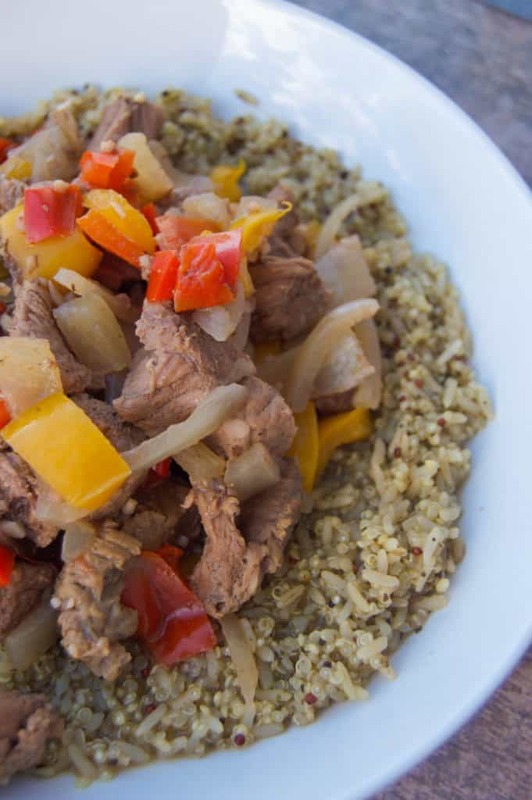 This Slow Cooker Steak and Bell Peppers is so easy to make and a must try that you are going to love! I made a brown rice and quinoa mix to pair it with! Start with cutting steak into cube/bite size pieces and chopping all vegetables. 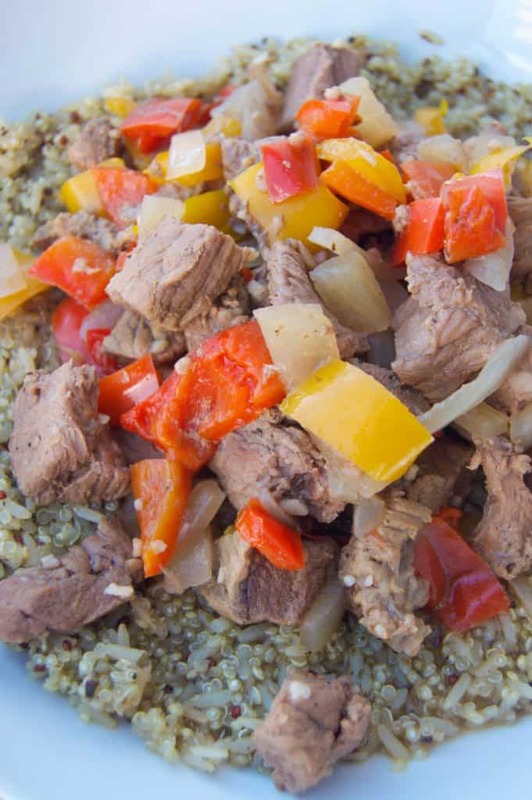 Place steak in the bottom of your slow cooker and top with chopped bell peppers, onion, and minced garlic. Add Worcestershire sauce, beef broth, salt, and pepper and gently mix. Cook on high for 3-4 hours or until fully cooked though. Serve over rice, quinoa, or pasta.